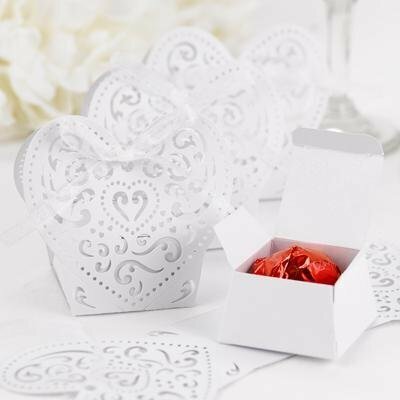 Your guests will love these delicate white shimmer favour boxes with heart-shaped, die-cut wraps. White sheer ribbon is included. Fill these with chocolates, almonds or any other tasty sweet. Perfect for your wedding bomboniere. Size: 3.8 cm x 3.8 cm x 2.5 cm (box), 8.2 cm x 7.5 cm heart wrap.